The Export Development Council (EDC), in its meeting last 09 March 2018 approved the Philippine Export Development Plan (PEDP) 2018-2022 through Resolution No. 02, s. 2018 endorsing the PEDP 2018-2022 for the President’s approval. As part of the process, the PEDP 2018-2022 will be submitted to the Office of the President through the Cabinet Economic Development Cluster. Sec. 5 of Republic Act No. 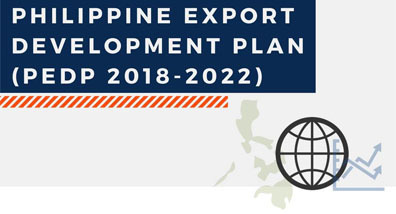 7844 or the Export Development Act (EDA) provides that the President of the Republic of the Philippines shall approve the PEDP prepared by the Department of Trade and Industry (DTI) which shall form part of the Medium-Term Philippine Development Plan, now called the Philippine Development Plan (PDP). The PEDP 2018-2022 embodies the country’s export thrusts, strategies, programs and projects which are aligned with the PDP 2017-2022 and the 10-point socio economic agenda of the President for enhanced competitiveness and support to SMEs. It shall be jointly implemented by the government and export stakeholders. The Plan aims to increase exports to $122B-$130B in 2022. Data and analyses in the said Plan were gathered from the EDC Visioning and Strategic Planning and a series of focused group discussions with stakeholders from the government and export sectors in NCR, Cebu City and Davao City in 2017.